Mishap With The Time Machine. Tonight we step out of the time machine, and checking the date, discover it's the same evening and time! Oh, oh. Who are these people, wearing such outfits as they have on? Maybe the time machine burped. Maybe these people were moved into the future, instead of me moving back. Ha,ha! Tonight finds us at the annual French & Indian War reenactment at Rogers Island in Fort Edward, NY. Conveniently located alongside the CP (D&H) bridge over the Hudson River! 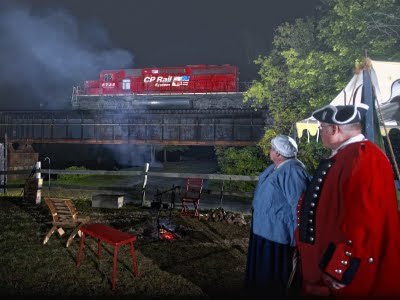 My friends and fellow railfans Bonnie and Richard Wingler pose for tonights night photo watching 414s SD 40-2 leader start across the bridge as the rain begins to fall. Not a poor location for a campsite eh? 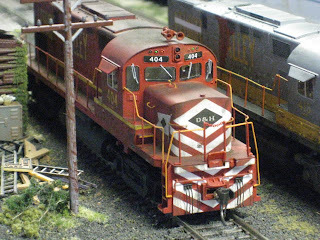 CP contributed an SD 40-2 to the scene. It's nearly a three hour drive down here from the compound, including a stop at a Subway of course. I had planned on shooting 415 returning from Whitehall later in the night, only to notice the mighty fine broadside angle seen here. After expressing my appreciation for the northbound broadside, Richard informed me that 414 was due in a half hour! So I hustled around, setting up a few lights, positioned Bonnie and Richard at the corner of their tent, and hoped for the best! LOL! Thankfully this involved a small area to light, so a handfull of flash units did the job. With a nice little campfire going, (can't you just smell the smoke.....) temps in the low fifties this is really fine. Once 414 had passed by, us three chatted for a while, we had'nt seen each other for nearly a year, before Bonnie and Richard headed off to sleep. I could have stayed all night here, LOL! But, it turned out I would not have seen another SD 40-2. Thank you to Bonnie and Richard for inviting me down here! Shot on Sept. 26, 2009 at 22:26 with the 5D and Nikkor 14-24/2.8 zoom set at 18mm and f2.8. Please enjoy! Comments are welcomed. "The building of the track along Willsboro Bay, where the Sage Mountains meet the shore, was where the heaviest difficulties were encountered. In places, drillers had to be let down by ropes from the tops of the ledges, to commence blasting. Along this section the scenery compares favorably with similar locations in the mountainous western portion of the United States. "On this six-miles the rock cuttings are almost continuous. The track runs about 90 feet above the surface of the lake while on the left the perpendicular wall grows, as we move northward, until finally it culminates in the Great Red Rock Cut, a smooth perpendicular precipice one hundred and five feet above the track at the highest point, while below it also extends ninety feet down to the water's edge. One hundred feet out from the shore, the bay is 210 feet deep. A halt was made here to give all a chance to view this wonderful piece of work, and then the train crept along on this shelf and through the tunnel. The tunnel is one of the handsomest ever constructed, the shape of a perfect arch through a rock which sparkles in the sunshine as if it were made of crystals." The above from: A Historical Sketch of the New England Berkshire & Western Railroad Company courtesy of Rensselaer Railroad Heritage Website. SHot on Sept. 21, 2009 at 08:22 with the 5D (ISO 160 & 1/500) and Zeiss ZF 28/2 (Nikon) lens set at f6.4. Please enjoy! Comments are welcomed! The Battenkill's two old workhorses switching the Cargill mill at East Greenwich. 605 and 4116 doubleheading at the Cargill lead. This summer on the K&SA. At the beginning of the year, the end of track was at MP 2.44 (miles measured in 88 ft increments) with the roadbed in its early stages to MP 5 which is at the edge of the driveway. During the first two work days of the year(May and June), we were waiting for rail to be delivered so we worked diligently on finishing the roadbed to MP 5 and doing needed maintenance on the line. The original crossing into the backyard was relocated and smaller jobs were completed up and down the right of way. July 12 was the big work day since I had gone to MA and picked up enough rail to build 250 feet of track and we had the roadbed to build it on. We had also cut and laid out enough ties so the only thing the crew had to do was put the rails together and start spiking. Until July all the work days we'd had have been in incredible weather and this day saw us lay track to just beyond MP 4 (just about 145 ft). We may have been able to get more track assembled that day but one crew was also dumping stone so this new track was finished and ready to ride on by the end of the day. I hadn't planned on any meet for August since I was having surgery on my shoulder and would be in a sling during most of the month. My "crew" convinced me to have one anyway since they wanted to work (I could supervise). August 9th we had the 'big' meet. The big project was to build the crossing across the driveway. First the track between MP 4 and MP 5 had to be finished to ensure the final alignment of the crossing. We had two crews working, one was digging out the driveway and getting the crossing prepared and the other was spiking track. This meet was almost a washout, there was a light rain all day but my crew kept at it even into the darkness under a tent to finish the crossing under my vans headlights. 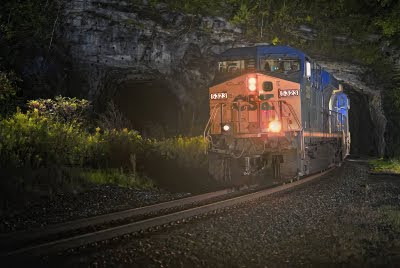 Last week I returned to CSX's State Line Tunnels West Portal. Four years have passed by already since my first visit here! Wow! It's hard to believe. This is such a fine location for night photos, with no ambient light. Train traffic was way down from what I remembered four years ago, understandably. I spent Thurs. & Fri. nights here from 8 PM ish to 6 AM ish, and saw five or six eastbounds, and two or three westbounds. Of course, for all I know, the majority of trains could run during the day here, while I'm asleep! Each night, a couple eastbounds passed by the lighting first, and likely passed the word on to westbounds they met further east to sit up straight coming out of the tunnel. The crews were friendly and several gave me a couple of toots in passing, perhaps they remembered my photo from here featuring their railroad in the CSX 2008 calendar. One thing the crews didn't do is slow down for me, (not that I wanted them to) the westbounds are dropping down the west slope of the Berkshires here, and I'm guessing they were doing an easy forty mph out of the tunnel portal! The flash lighting freezes everything sharply at that speed fine. Dawn was barely beginning to lighten the sky above the tunnel at the end of my second night, I was contemplating gathering up the lighting, standing outside "the cah", to head for the tent and sleep, when I realized the faint sound I was hearing was in fact a westbound coming downgrade toward me! Back atop the stepladder, the crossings above me are whistled for, the lighting coverage tests out good, and I wait in the pre-dawn darkness. Within a couple minutes, CSX 5323 swings out of the tunnel and into position......for a moment, at forty mph, then she is by me, in a roar of sounds and wind! The resulting photo turns out to be the best of the two night visit! Shot right on the edge of dawn! Shot near Flatbrook, Mass. at 05:41 on Sept. 12, 2009, with the 5D and Zeiss ZF 100/2 (Nikon) lens set at f2. Two flash units/stands erased on the left of the scene. Please enjoy! Comments are welcomed. This is a project I started today. A company called Fesco made a toy box caboose around 1973 for $17 at the time. I recently acquired one through eBay. I had no plans to work from so I improvised my own design along the way. The frame consists of a one by two steel tube with short pieces used in additon for side bearings. The floor is two layers of 3/4" plywood screwed and laminated together with construction adhesive. The carbody is screw and glued to the top layer of plywood. 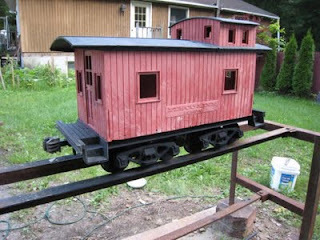 The bottom layer of plywood is concealed by a piece of one inch channel screwed and glued to each side as well as the pilot on each end of the caboose. The trucks and couplers were acquired a few years ago through different suppliers on eBay. The trucks are manufactured by K and M and are Aluminum. The couplers are RMI and made of stainless steel. I plan to order grab irons from Precision Steel Car Co.. I am still brainstorming on what to do with the end handrails. The smoke stack will be 1/2" iron pipe with a tee. I have enough plyoow left over to make a seat so Karsen can ride in it or perhaps a seat and cushion at the roof level with some foot pegs for an adult. The crew is in the Silver Diner, where the twins work as waitresses. The crew enjoys a good cup of coffee, a home style meal and a good view. 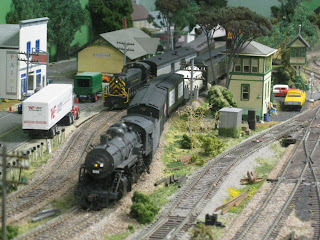 For a few minutes, Skenesborough Station looks like a busy place as the Rutland Milk returns to VT with a few emptys while the Evening local waits for Conductor Hewitt to give the signal to leave. What little money the SVRR had available went into electrical upgrades and weather stripping to keep the cab heaters running and the drafts to a minimum. public image is not a factor. If it were we'd sill be running passenger trains. Anyway, the guy who would run the wash rack got furloughed last month. I work for the Providence & Worcester and frequently make the CHFP/FPCH runs to Queens. Attached is a night shot of CP Train 416 we did a couple of weeks ago when we ran late and they came in to Fresh Pond right behind us. Also attached is a shot on Hell Gate that Id like to be able to duplicate with a CP train someday!. Enjoy! Glowing within after successfully capturing the waterfall view of the combined VIA 14 & 16, I waited in Riviere-du-Loup after collecting the lighting equipment to check the westbound VIA 15s power. Sure enough, both the new rebuilds, 6400 & 6452 were on the point. The unique F40s would be returning the following evening here above the Upper Falls. Not that I would be in any shape to take a photo, the forecast for tomorrow was for sunny skies on the Gaspe', guess where I was headed....... Driving over to Matapedia later, I was pulled over by police in Trois-Pistoles, I was'nt speeding when I went by him, so I was quite surprised to learn the officer stopped me to check my license. I thought police needed an excuse to stop you? Obviously, I was wrong, Ha,ha! Also.......obviously, I was not going to bring up this belief with the officer! I noticed the car trailing me had pulled over behind the cruiser, and the officer had me pop the back open and get out. Walking back to the rear I met two men wearing street clothes standing with the officer, all three staring into the open trunk, LOL! One of the men smiles at me and asked how's it going? We three had a humorous discussion about my lifestyle before the two men left, leaving me with the officer. I'm certain they had never seen a lighting system like that in a car trunk! While I waited for the officer to finish his work in the cruiser, here comes a tractor trailer westbound past me. The truck portion painted in the latest CN locomotive scheme, hauling a CN Intermodal trailer! Oh yeah....I thought. Only along the CN would I expect to see that! Heaven forebid we put that trailer on one of our trains! Sheesh! Finishing his background check, the officer and his partner wished me good luck. "Trains are your passion eh?" I smiled and agreed with them. Finally heading out again, I arrived in Matapedia after the Chaleur had left, I was not surprised, with the nights events behind me. SO I headed east up the peninsula for New Carlisle, where the crews change. 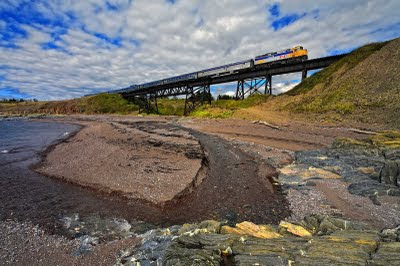 Believing you will come across a seven car passenger train along the Gaspe' Coast is a dream. Besides, the most photogenic locations are east of New Carlisle as well. Five hours of driving later, I've successfully overrun the train "somewhere", arriving at St. Therese-de-Gaspe' at the scheduled time for VIA 16. Walking stiff legged down to the beach, I discover this formation in the sand, which I've only witnessed once before among my many visits here, and promptly celebrate my good fortune by trying different angles with the bridge. The sunny skies are degenerating into thickening clouds streaming overhead, the tip of the iceberg as it turned out. By three PM hail would be falling here, followed by heavy rain. Just past eleven thirty, I hear the faint whistle of VIA 6421, the sun hidden by clouds more than it is out now. 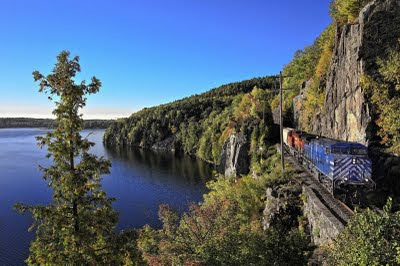 Several minutes pass as the Chaleur closes in on this spellbinding location, then the sound of an F40 arrives at the same time as the 6421 is sighted above the bluff to the west of the bridge. The sun in the clouds, the 6421 drifts slowly up to the end of the ten mph bridge, then starts across. Halfway across, a beam of sunlight lights up the near end of the bridge and beach, holding there as VIA 16s headend pulls into the sunlight! I'll take it! Shot along Chaleur Bay at Saint Therese-de-Gaspe', Quebec on Sept. 5, 2009 at 11:38, with the 5D and Nikkor 14 - 24/2.8 lens set at 16mm. Please enjoy! Comments are welcomed. CH has had a busy summer! 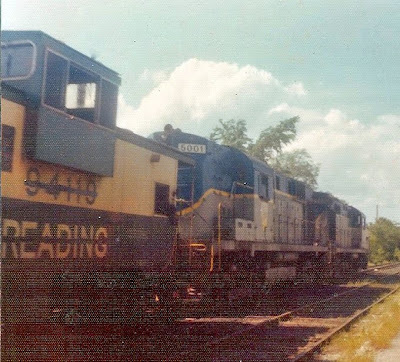 This is a picture of a Reading Caboose on the Slate Picker, in the middle 70s, that Chris Lynch gave me while I was in the hospital in Burlington. I will admit that I do not remember it but we had lots of junk back then. 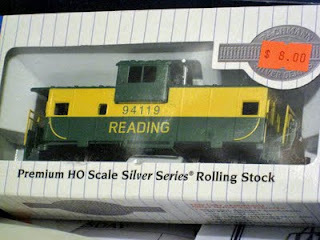 I came across a cheap Reading caboose at the show in Hartford and said what the heck. I'll grunge it to look like that one. 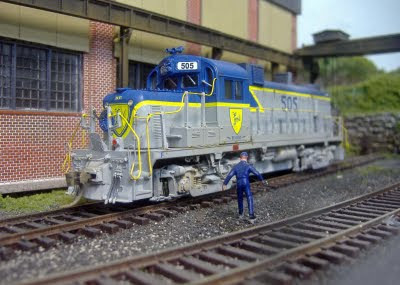 Check out the number on the real one and the HO caboose. What are the chances of that??? 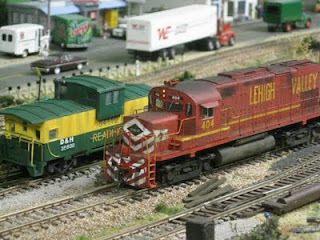 Summer vacation is over, kids are back in school and we head back to the basements for some model railroading! I have received many posts over the summer and I'll share them with you. 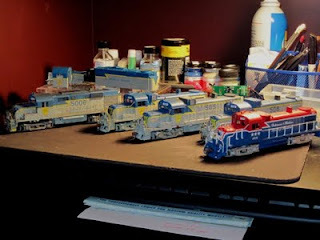 I like to call this "What I did over summer vacation", railroading style, lol...enjoy!